14 Days in Diyarbakir - 14 Photos of Amed - 14 Pieces on Tigranakert. "Repair's" special correspondant MJM, a french-armenian journalist, has recently spent two weeks in the current capital of the South Eastearn Anatolia to meet with the past, present and future of the thousands of Armenians who used to live in this city before the 1915 genocide. During his travels, MJM shares with us his many encounters with places, women and men whose story is undeniably related to the Armenians. This photo essay was done in May 2013, some situations described in these articles have evolved since then. After lunch at Surp Giregos, some diners meet again at the Assyrian church of the Virgin Mary. 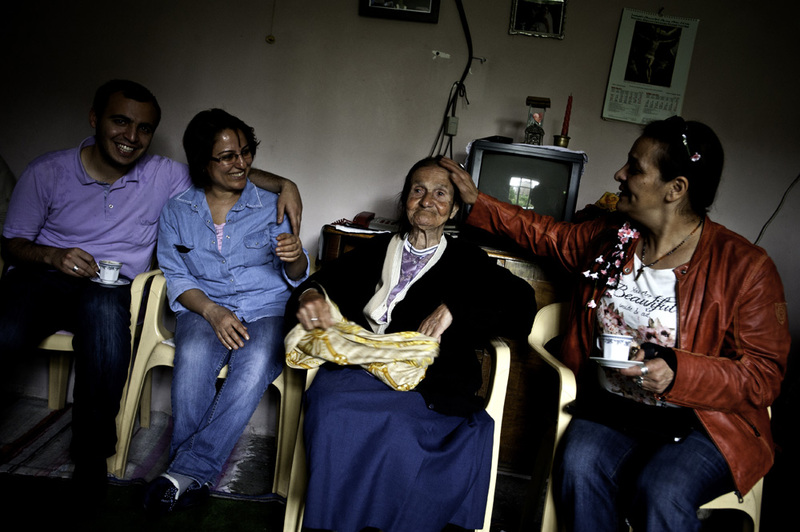 It is home to Sarkis and Bayzar, 83 and 85, the oldest couple of Armenians in the city. During my meeting with Abdullah Demirbas, Mayor of the Sur municipality, he had explained to me that, “at the start of my first mandate, only two people in Diyarbakir would openly say that they were Armenian.” This brazen pair is no other than Sarkis and Bayzar, whom the Assyrian community settled in their church after the last members of the community left 26 years ago. Since them, they have been tending to this place of worship. The couple married 64 years ago in Surp Giregos, in the little church adjoining the main building which, at the time, belonged to the state. It was one of the last weddings celebrated in that church. In the room, we are fifteen or so people gathered to have coffee. The warm and relaxed atmosphere is conducive to conversation, and personal stories are told more easily. Amidst the rumble of discussions starting here and there, a woman born in Silvan, who came with her mother, is quietly crying while telling about the death of her husband, killed by Hezbollah in 1992. “In Silvan, there still are some dolmes homes, and even today we are blamed for being non-Muslims. People live there on my land at the moment, but what can I do about it? My husband’s grave is there, everything is there. I can’t leave,” the lady says in a strange, very soft voice and later, in a burst of anger, she will call the Kurds all kinds of names. The 30-year-old freelancer and photographer, MJM, has worked for various newspapers and magazines. His recent work with the Yerkir NGO has permitted him to further develop his views and understanding through photos and documentaries in Armenia and Turkey. An overview of his work is available on his website www.mjm-wordsandpics.com. Day 13 - “The diaspora must understand Turkey and Armenians from Turkey"